Paul Thomas Anderson’s There Will Be Blood (2007) is probably one of the best films of the past quarter-century – probably one of the 100 best films of all time. So anything he does subsequently will have a hard time measuring up to what may be seen as his masterpiece. The Master has a lot going for it, and if it doesn’t quite live up to There Will Be Blood, it’s as much a function of the story and subject matter (as compared to its predecessor) as to anything else. Don’t be fooled, however: The Master is most definitely not, as many have indiscriminately suggested, a movie about the birth of Scientology or the character of L. Ron Hubbard. While the character of Lancaster Dodd, a cultish leader/philosopher who blends a mishmash of therapeutic techniques and science fiction, may be inspired by or resembles Hubbard, the film, as written by Anderson, is much more concerned with the psychology that informs the group dynamics of a cult, the attraction of cult-like leaders, and the homo-eroticism that infuses the male bonding that is at the heart of a group like “The Cause,” the film’s version of a Scientology-like religion or method. 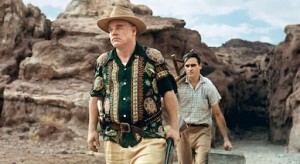 The film’s strongest point, however, is the Oscar-caliber performance by Joaquin Phoenix, channeling Brando, Nicholson, Day-Lewis, Penn and a whole host of other outsider actors – really breaking through to that rarefied level with a quirky, agitated, demented and alluring performance that almost throws the entire proceedings out of balance. New York Times movie critic A.O. Scott cutely titled his review of The Master thusly: “There Will Be Megalomania.” Indeed.